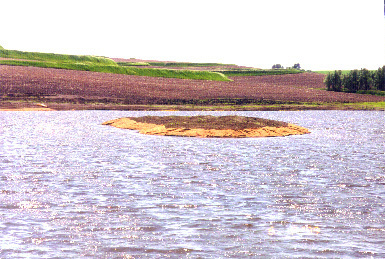 Islands are susceptible to accelerated erosion since they are constantly pounded with waves regardless of the wind's direction. This island was hand-seeded by our staff with an aggressive erosion-control seed mix, then protected with biodegradable erosion blanket. Wetland plants were also installed around the perimeter of the island to serve as a wave barrier.